•UNIQUE SINGLE LOW RATE ALL YEAR THROUGH! * no high low season! €65 1 occupant; 2 people €85/night; 3 people € 105/night; 4 people €125/night. The apartment is located in Via Giuseppe Ravizza: a silent and quiet street. It has an indipendent entrance from a private courtyard. The patio is at the guests disposal. The studio is at the ground floor.It's a quiet and silent place whrere you can sleep at night. It's about 40sm (with A/C) and it consists of living room with a Murphy bed sleeping 2,a super confortable pullout couch sleeping another 2, table seating 4, 32' LCd fully digital TV , DVD player. Separate fully furnished kitchen, washing machine. Very big luxurious and UNIQUE bathroom with jacuzzi seating 2, Separate shower. Towels and Linen included. All utilities included. Complimentary WI-FI internet access & A/C, Iron +board, hairdryer. 5 Windows: 2 In The Bathroom; 1 In The Kitchen: 2 In The Room. It's never been easier to reach your Home in Rome from Fiumicino airport: Jump in the train and get off at TRASTEVERE STATION. The apartment is located in a residential area where real people live: away from the touristic confusion close to the city center. There is a private coutyard where you can start your day pouring and sipping your tea or coffee... warming up.... getting ready to throw yourselves.... back to the past in the Eternal City. With a 10 minutes ride on tram line 8 you will be in the very heart of Trastevere with his characteristic restaurants, crowded 'Piazza's' and sleepless nightlife. If you get off at the following stop you will be in Largo di Torre Argentina (city center). From there you can walk to the main city attractions: Foro Romano, Pantheon, Spanish steps, Piazza Navona, Campo de' Fiori, Via del Corso, Piazza Venezia, Colosseo etc. Supermarket, Bakery, Cake shop, Bars, Pizzerias, Chemist's, Fresh fruit & vegetables shop, Dry cleaner's, Herbalist just few steps form the apartment. Public Transport:: From Trastrastevere Station with a 10 minutes train ride (2 stops) you will be in S.Peter where you can visit the famous 'Basilica' and the Vatican Museums. It's located in quiet and silent street where after your Eternal City excursions you can enjoy the deserved rest. 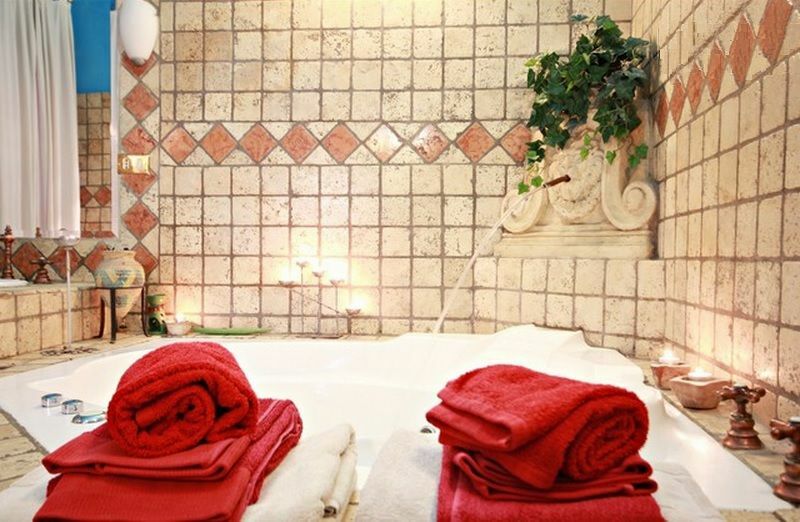 Relax yourselves in the SPA with a bath in the fantastic Jacuzzi while drinking a glass of Italian wine! You will feel like an Ancient Roman!...but with the complimentary WIFI high-speed internet connection you can stay in touch with your world, friends and families keeping them posted on your ROMAN HOLIDAYS. In Rome for work or study? .....the apartment is the best solution for WFP/FAO workers (2 train stops to Muratella) or John Cabbot University students. You don't need metro ! By tram line N.8 you will reach Trastevere district in 10 minutes and the Historic Center (Largo di Torre Argentina/Piazza Navona/Pantheon/Campo de Fiori) in 15 minutes. •Price of €65 Euros is based on 1 occupant. Standard check in time 14:00. Standard check out time 10:00. A real ' live like a local experience ' where real romans live .. just 2 steps from historic center. A place located in a silent and quiet street where you can realax and sleep at night. - The Bathroom ( designed and crated by myself) makes this apartment UNIQUE, you can't find anything like that in Rome!!!! !The Jacuzzi seating two people and withsome candles lit and a glass of wine it will make your stay a 5 star one!!! The Patio..... A nice and beautiful outdoor space where you can have breakfast, eat ,drink surf the internet and relax. Limousine service from/to Airports available on request from €60 . Ask for it! David's place is just spectacular. He's thought of absolutely everything, from the beautiful bathroom and spa tub, down to the details, like the mosquito repellent wall-plugs. The AirCon was wonderful to come back to in the Rome heat, and we found his place wonderfully situated for a spin into town, a 5 min walk from the closest tram line and a 10 min walk to the closest train station. Trastevere is a great little neighborhood as well, trendy, with good food and not too overrun by tourists. Grazia, David, we hope to return soon! Thanks Danielle for enthusiastic review . We arrived at David's apartment on a Friday afternoon during rush hour. We caught the bus from Rome Termini, and were a bit frazzled. As soon as we stepped into the apartment, the traffic noises faded, and the cool clean roomsmade us feel welcomed. We had read that Trastevere is a vibrant neighbourhood full of ristorantes, pizzarias, live music and lots of atmosphere. We confirmed this for ourselves Friday after we got unpacked. We also found all of Rome to be very walkable. After a day or evening of exploring, it always felt good to return to the peaceful calm of David's apartment and jump into the jacuzzi. Kitchen is set up well to cook, if you wish. Grocery stores and small markets are a short walk from the apartment. All in all a great combination of being within 10 minutes tram ride distance of the many wonders of Rome, being in an exciting neighbourhood, and being able to retreat to the calm of a well appointed apartment at the end of the day. David is a fabulous host and is meticulous with detail! From the time of booking until our arrival, David was very informative on how to get around, what to do and see and watch out for. The apartment wad very clean and has an elaborate "Roman Inspired" bathroom that might be bigger than the entire apartment! I highly recommend soaking in the jacuzzi after a long day of walking around and site seeing;) The neighborhood is in the Ostience quarter which is known for its hidden trattorias and after hour enclaves. Its in close walking distance from the metro and buses and 15 min walk from Trastevere. I highly recommend this Airbnb for your next stay in Roma!! What else can I say other than David was absolutely amazing. My friend and I had reservations at another Homeaway for our stay in Rome, but unfortunately it fell well below our standards. We decided to start looking for a new place and we stumbled upon David's flat and decided to send him a request. It was around 8:30pm and we weren't sure if he would see our request until the next morning, but we received a response almost right away. It was around 11pm when we met up with David. He was absolutely great about accommodating us at such a late hour. He even stayed around to give us a thorough run down on everything in the apartment (any tricks we might need to know), asked us about our travel plans and gave us recommendations as well as things to watch out for, provided us with a map of all the important waypoints around the apartment (grocery, metro, etc), recommended a couple of apps that would help us with our travel, and was just overall a very warm and welcoming host. As far as the apartment goes, it's a nice little studio with a pullout couch and a Murphy bed, which are both the most comfortable beds we slept on while in Italy; a kitchen that doesn't have a lot of counter space, but the overall organization and gas stove make up for the space; a bathroom that is absolutely amazing. The bathroom is probably the same size as the rest rest of the apartment. It has a massive jacuzzi tub, a shower, plenty of counter space with two sinks, a separate thrown room, and enough floor space for Roman chariot races. As for the exterior, it has a quaint courtyard that you share with another Apartment, but it's separated by a small divider so you don't run into anyone if you don't want to. The apartment is absolutely amazing and way more than what we could have asked for. David's hospitality is one to be rivaled. On a scale of 5 stars, I give David and his apartment 10 stars. I will definitely be staying here next time I come to Rome. We spent 5 nights in David's apatment last week. (29 Jan-03 Feb) We were 2 adults and 1 children. Flat has everything you would need for short stay. Well connected to attractions, in a residential and genuine area so we were able to experience the LIVE LIKE A ROMAN instead of just being tourists. There is PAM and Simply superermarkets in around 100-150 mts. Flat was also clean and has starter kit like coffee, olive oil -tea etc. David was very helpful since our first contact and also guided us when we needed anything. The satisfaction of my guests is Doc important to me. Hope to have you back in the future. Walking distance to TRASTEVERE STATION where the train from/to FIUMICINO INTERNATIONAL AIRPORT stops ( ticket to airport costs €8.5 Euros). The apartment is located in a silent and quiet street , friendly and Safe neighbourhood with lots of restaurants and shopping in area. Quick and easy train connection to Muratella WFP and FAO headquarters. Good bus and tram service. By tram line N.8 (150 mt from the apartment ) you will reach Trastevere district in 10 minutes and the Historic Center (Largo di Torre Argentina/Piazza Navona/Pantheon/Campo de Fiori) in 15 minutes. Bus line H takes you to Termini station in 30 minutes (where the shuttle from/to CIAMPINO airport stops). Payments are in Euros. The price € 65/ night is based on 1 occupant. 2 people €85 /night 3 people €105/night 4 people €125/night Final cleanings fee €50 Booking less than 3 consecutive nights when 3 nights are avaialble on calendar will incur in an extra fee of €50 to be paid cash on arrival Check in after 09:00pm attract an extra fee of 50 euros.